Fire Island is one of the barrier islands that lies parallel to the south shore of Long Island, and is separated from Long Island by the Great South Bay. Most visitors take a ferry or private boat to reach Fire Island but there are also two bridges. The Robert Moses Causeway--see photo above--on the western end of Fire Island, that leads to parking lots at Robert Moses State Park. The William Floyd Parkway leads to Smith Point County Park on the eastern end of Fire Island, where there is also a parking lot. The rest of the island has no paved roads. Fire Island National Seashore encompasses 26 miles of Atlantic Ocean and bay shoreline, lush dunes, maritime forests and 17 residential communities. It also contains the historic Fire Island Lighthouse. We walked on the boardwalks that lead to the lighthouse. The boardwalks help preserve the terrain and also protect walkers form coming in contact with poison ivy. The Fire Island Lighthouse is operated by the Fire Island Lighthouse Preservation Society, under a cooperative agreement with the National Park Service. The light is still owned by the United States Coast Guard, and is maintained and operated by the Society as a private aid to navigation. I love to visit lighthouses--they are such stalwart vestiges of the past. The ruins of the original 1826 lighthouse that stood 74 feet tall. Please click on the photo above to read more about the first lighthouse. In 1857 the US Congress approved the construction of a new 167 foot lighthouse, which is what stands today. 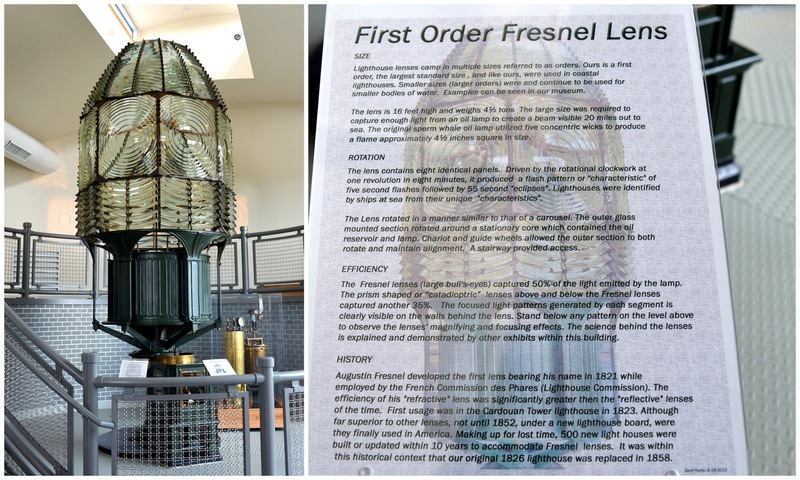 Its height and First Order Fresnel Lens would allow for better viability for the ships at sea. You can read more about the history of the lighthouse of the Society's web page. 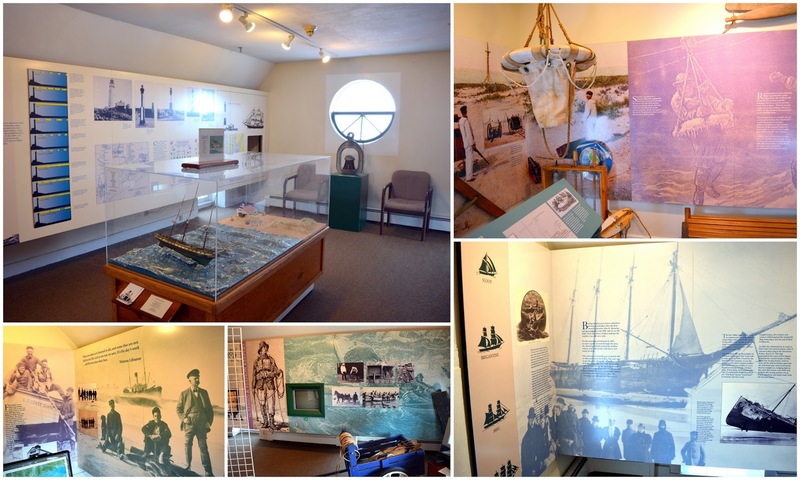 There was an interesting visitors center next to the lighthouse, as well as exhibits in the former lighthouse keeper's home, about the maritime history of this area and the lighthouse. The visitors center housed the First Order Fresnel Lens and information about it. This lens was used in the lighthouse from 1858 to 1933. A display about former lighthouse keepers. A placard with information about the different communities that exist on Fire Island. About 400 people live on the island year round. After visiting the lighthouse we returned to the beach to continue our walk, and enjoy the beautiful shore. Having lived most of my life in the south shore of Brooklyn, near the Atlantic Ocean, I enjoyed seeing the ocean again, and more importantly spending time with my brother and sister-in-law. One of the joys of visiting New York is seeing our families, as well as seeing the famous city sights again. More about our trip on my next post! The photos I'm showing you today, were actually taken on a visit we made to NYC last summer, that I never had an opportunity to blog about. I wanted to share them with you now, as taking a ride on the NY Waterway Ferry is a wonderfully affordable way to see some of the sights of New York from the East River, plus it is a nice way to cool off on a hot summer day. My friends and I picked up the East River Ferry in Brooklyn Bridge Park. I blogged about Brooklyn Bridge Park when I lived in Brooklyn--click here to read that post. It is definitely worth a visit if you travel to New York City, as it has many new attractions and features and magnificent views of lower Manhattan. We saw lots of new construction going up in both Brooklyn and Manhattan on our last visit, and the same was true this visit. The skylines of both boroughs are growing higher and changing. The ferry has a nice topside seating area which allows one to have a good view of both sides of the river and enjoy some cool breezes. ...and saw the lower Manhattan skyline receding in the background. Next, we sailed under the Manhattan Bridge. The river is always full of both commercial and recreational vehicles. We sailed past Jane's Carousel located in Brooklyn Bridge Park--you can read about a visit I made to this wonderful attraction on my blog on this link. The American flag at the end of the ferry made a nice focal point with the city skyline behind it. The next bridge we sailed under on the East River was the Williamsburg Bridge. There has been a lot of new growth on the Brooklyn side of the river in this area, as you can see by the large condominium complex above. People were waiting on the dock to board the ferry. It was fun to see jet skiers enjoying the river! The Queensborough Bridge in the distance. We were now approaching Hunters Point South Park and Pier in Long Island City. The United Nations building in the middle of the photo above. Many more high condos along the Long Island City shore. I stayed on the ferry for the entire round trip and it soon turned around at this point. ...where again, we had a wonderful view of the lower Manhattan skyline. You can see the different ferry routes New York Waterways offers on this link. The East River Ferry website is here, and the fare rates can be viewed here. As always, I enjoyed my trip to New York City and will show a little more of what I did on some future posts. Now it is good to be home again in Colorado. We are having a bit of a heat wave here--how has the weather been where you are? It's the month of June, and soon it will be summer. It is the season when strawberries become plentiful, affordable and fresh! 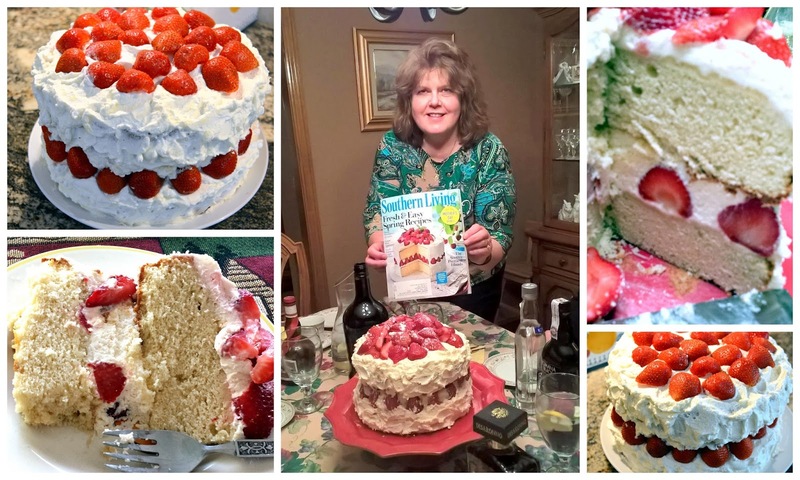 If you are looking for a delicious cake to make that incorporates fresh luscious strawberries, look no further than Southern Living Magazine's Strawberry Dream Cake! This cake would be perfect to make for any celebration. It is a flavorful, pound cake like density, vanilla/almond flavored cake covered with a "not too sweet" whip cream and mascarpone cheese combination frosting. Juicy, sweet strawberries become its main attraction both in flavor and decoration. When I saw this cake on the May issue of Southern Living Magazine I knew I wanted to make it for dessert for a dinner party my husband and I were hosting at our home. It was a big hit, with our guests, and one even asked me to pose with the magazine when I showed them where I found the recipe. As you can see, from the photos, when the cake is cut the inside will reveal rows of strawberries immersed upright inside the frosting. It makes a very pretty presentation and the standing strawberries makes the cake high and impressive looking. I enjoyed making and eating this cake so much that I soon made it a second time to bring to another dinner party. 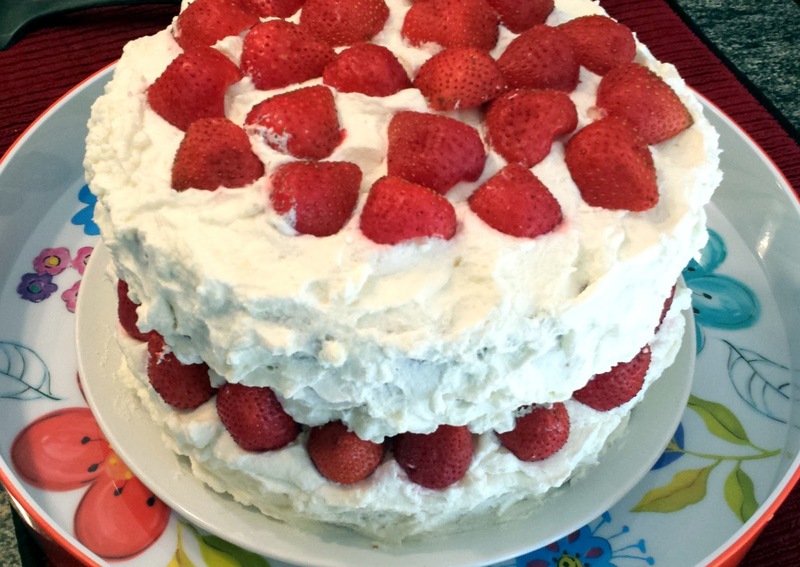 I've always loved Southern Living Magazine's recipes, and I'm glad to find another one that will be a favorite summer cake for me to make when strawberries are at their best.You can find the full recipe on the Southern Living recipe site click here. Some who also tried the recipe mentioned in their reviews on the recipe site that they felt the recipe did not make enough frosting, but I did not have that trouble at all. I would suggest if your strawberries are extra large you might want to make a larger amount of frosting to compensate for their size inside the cake. 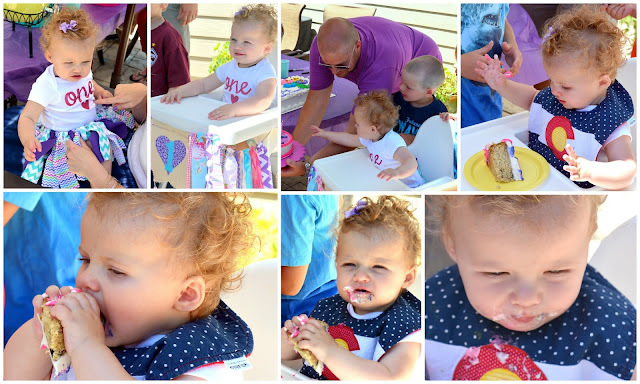 We had another special celebration lately---it was my youngest granddaughter's first birthday! She enjoyed her first taste of birthday cake -and ate the entire piece with gusto. It is hard for me to believe that she is already one. Time passes too quickly, but we feel very blessed to live close enough to see her grow up and to enjoy all her milestones. Spending time with our grandchildren is the best part of our life right now, and we cherish every moment! Wishing everyone a very Happy Father's Day!